Endocarditis is an infection of the inner lining of the heart’s chambers and valves caused by bacteria that enter through the bloodstream. How quickly endocarditis develops depends on the type of bacteria and whether your heart is abnormal. It’s called acute infective endocarditis when it develops quickly, subacute infective endocarditis when it develops slowly. 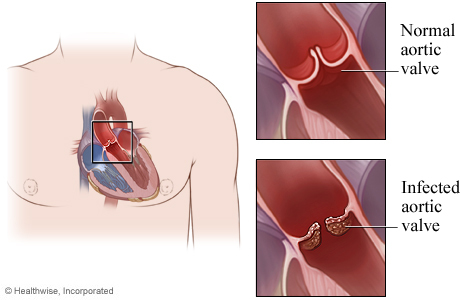 Endocarditis many times remains undiagnosed because symptoms, at least in the early stages, can mimic the flu, pneumonia or other general infection. Symptoms also can be relatively mild and slow to develop. Inflammation also can cause sudden, and severe, symptoms. Small, painful red or purple-hued bumps under the skin on fingers or toes. Small spots under the fingernails, on the roof of the mouth, the whites of the eyes, on the chest or inside the cheeks. Feeling full in the upper left part of your stomach. Swelling in the abdomen, legs or feet. Germs enter the body every day. A lot of them: Thousands of bacteria and viruses enter the body simply by breathing. More germs enter our body when we eat or drink, brush our teeth or cut our skin. A tattoo or body piercing can also allow germs into the bloodstream. When the autoimmune system fails to fight the germs, allowing them to reach the heart and multiply, the resulting inflammation of the endocardium becomes endocarditis. Illegal drugs injected with a needle contaminated with bacteria or fungi. Implanted medical device (pacemaker wire). Damaged heart valves (rheumatic fever or calcium deposits). First year after receiving artificial heart valve. Tissue damage caused by previous case of endocarditis. Your doctor usually relies on a blood test to diagnose endocarditis. Once the bacteria have been identified, an appropriate antibiotic will kill them. You will receive antibiotics intravenously for up to six weeks. You might have to remain in the hospital for at least the first week of treatment as your doctor monitors your progress. An echocardiogram, which uses ultrasound waves to produce a picture of your heart, will allow your doctor to look for signs of bacteria or other germs that have multiplied and formed clusters (vegetations) with other cells and matter in the blood. Surgery is sometimes required if endocarditis is caused by fungi (instead of bacteria) because it’s more difficult to treat. A damaged valve or repeated infections also might require surgery.